I received this from Bloomsbury in exchange for an honest review. As always, my reviews are fair and non-bias. Sky and River have always lived on Island, the only world they’ve ever known. Until the day River spots a boat. Across Ocean, in a place called California, Sky is separated from River and forced to live with a grandmother she’s just met. Here the rules for survival are different. People rely on strange things like cars and cell phones. They keep secrets from one another. And without River, nothing makes sense. Sky yearns for her old life where she was strong and capable, not lost and confused. She must find River so they can return to Island, but the truth behind how they ended up there in the first place will come as the biggest shock of all. Searching For Sky had a completely different first reaction for me when I first see a book or hear about it. I didn't even think about it, I just knew that there was an amazing story in the pages. And that COVER...is even more beautiful in person, believe me. I love the US one, but my favoritism stays with the UK version for definite. Sky and River have lived on Island for as long as they can remember, and it's the only place that each of them can call home. They call it "Island", where they have adapted to their limited resources not knowing any different, like "Bathroom Tree", "Falls" and "Ocean", everything had a certain name for them. They live there alone after Sky's Mother and River's Father were found dead, and had to survive by themselves, only counting on each other. River sees a boat one day when he's catching fish for him and Sky, but they aren't certain what a boat even is. They soon find that the people on the boat arrive at the Island to take them home - even though Sky has no idea where that place even is - to a place called California. There, things are very different. Sky is separated from River and meets her grandmother who immediately tries to connect her to a new way of living by getting a team of experts to teach her everything someone of her teenage-age should know and do. Being set in Sky's POV, nothing was limited at all by not being able to get inside her head and emotions. I instantly connected with her, through sympathy and compassion for her confusion and brand new eyes at California, a place she didn't even know existed. Things in the real world are painstakingly difficult to grasp and day after day, Sky - who's been told that her name isn't even her own - feels lost by association in her new life. All she knows is Island, and even though she tries and learns new things every day, she just wants to be reunited with River. It was tragic what happened in Sky's life, and as she learns the startling new information about where she came from, who her Mother and River's Father; Helmut, really were, Sky can't help but try and grip the good memories tighter. All she knew was that with the help of her grandmother's neighbour; Ben, she needed to find River. She had to go back to Island. Searching For Sky really made me feel for the characters, in a way that I could picture Sky vividly in this world that felt so dystopian to her. I felt so bad for River, and although selfish at times, I felt remorse for Sky's grandmother who so desperately just wanted for her to feel at home. After all, she had lost two people she loved and never thought she would see again. Overall, Searching For Sky is a book filled with the qualities in a book I love; an impeccable plot, an ending to make you tear up, characters I empathized and a story that won't leave my mind. Searching for Sky definitely made my favourites list for this year - an exceptional and impressive five-star novel. I loved moments between Sky and Ben, and even though she felt more inclined to feelings toward River, they seemed like they really hit it off. He was more gentle in the way he taught her things about the World, unlike her grandmother, so she felt more relaxed about trusting him and it showed. For fans of YA Contemporary, particularly if you're a fan of hard-hitting novels (in the emotion sort of way). Adult readers will love Searching for Sky alike with it's readability being perfect for all ages from teens and up. 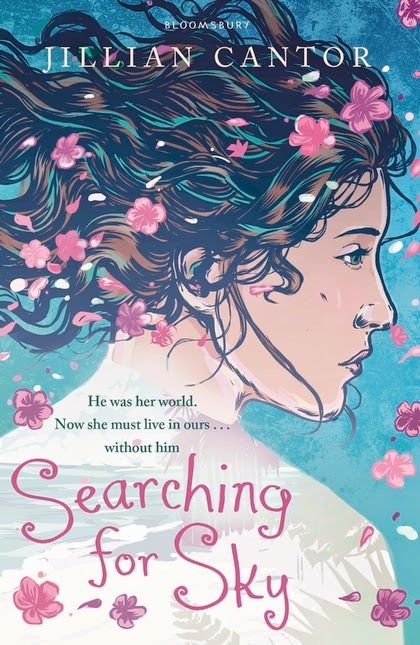 Have you read Searching For Sky? Tell me what you think in the comments or on twitter! happy reading!